Judge Larry Bravo congratulates Gilbert Aguilar after administering the Oath of Office. 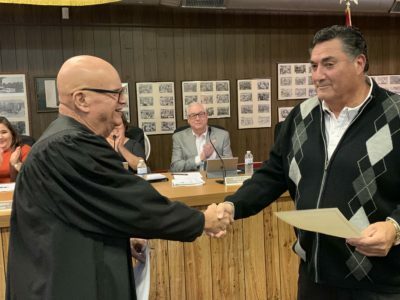 At the January 2019 Superior Town Council meeting, the Council accepted the application of Gilbert Aguilar to fill the vacant council seat. Aguilar had planned to retire his seat when his term ended in 2018. When the seat was left unfilled after the election he submitted an application to be appointed by the Council. During the meeting, Councilmember Aguilar stated that he was happy to return to service and is looking forward to seeing many of these projects move forward. Vice Mayor Michael Alonzo was also reappointed by the council to continue serving as Vice Mayor. The council unanimously approved an ordinance to re-zone a the former Knights of Columbus located at 545 Porphyry from Urban Residential to the Planned Development Zone District. This will allow the new property owners to develop the building as a multi-family apartment. The Council heard a presentation on the 2017-18 Audit by Hinton and Burdick. During the presentation Ms. Robyn Sibley explained that the Town has received an audit with no findings and that all audits are complete and the town is in compliance with having their audits completed on time. Rebuild Superior Inc., consultant Karen La France presented the completed Hotel Feasibility study. This study was commissioned through a grant from Resolution Copper. The Town contracted with Rebuild Superior Inc to commission the study. Elliot Pollack and Associates were selected to complete the study. The study found that the Superior is in immediate need of a 60-room hotel with a minimum of 500 square feet of meeting space. The next steps will include marketing the study to potential hotel developers. Tackling blight continues to be a top priority for the Town Council. 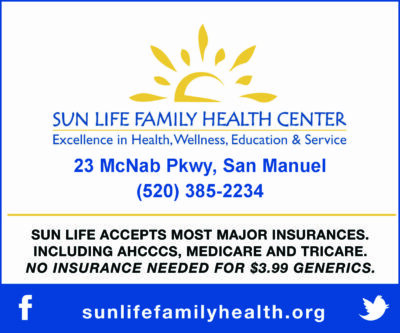 They approved a resolution to file a judicial abatement and foreclosure lawsuit on two homes with ACCHES Medical liens to abate the public nuisances with the Town of Superior. The properties that will be affected by this lawsuit are 458 Newmont St. and 309 N. Magma Ave. Both of these properties have been abandoned for many years and have become blighted and have created many safety concerns in those neighborhoods. During the meeting the council heard a final presentation on the Urban Land Institute Technical Assistance Panel that was conducted in Superior and also received an update on the park and recreation capital improvement plans being conducted by Central Arizona Governments through Community Development Block Grant funds. Pinal County Sheriff Mark Lamb also presented a quick update on activities at the Pinal County Sheriff’s Office.